The Morning of the Magicians (French: Le Matin des magiciens) is a 1960 book by Louis Pauwels and Jacques Bergier. Often referenced by conspiracy theory enthusiasts and those interested in the occult, it presents a collection of "raw material for speculation of the most outlandish order", covering topics like cryptohistory, ufology, occultism in Nazism, alchemy and spiritual philosophy. Written in French, Le Matin des magiciens was translated into English by Rollo Myers in 1963 under the title The Dawn of Magic, and in 1964 released in the United States as The Morning of the Magicians (Stein and Day; paperback in 1968 by Avon Books). A German edition was published 1962 with the title Aufbruch ins dritte Jahrtausend (Departure into the Third Millennium). 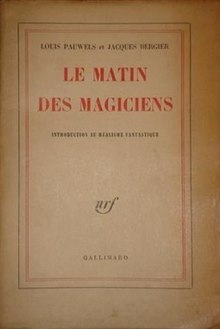 The Morning of the Magicians became a cult classic within the youth culture in France through the 1960s and 1970s. Cautioned by the hostile reception by skeptic reviewers (notable among whom were secular humanists Yves Galifret, Evry Schatzman and Jean-Claude Pecker from the Rationalist Union, who debunked the book in Le crépuscule des Magiciens; "The Twilight of the Magicians"), Pauwels and Bergier went on to pursue their interest in the paranormal in the review Planète, dedicated to what they termed réalisme fantastique (fantastic realism). Both The Morning of the Magicians and the Planète review had considerable influence on the esotericism of the 1960s–1970s counterculture, being a forerunner to the popularization of New Age ideas. Pauwels and Bergier worked on the book during five years, compiling voluminous documentation incorporated into the Bibliothèque nationale de France as Fonds Pauwels in 2007. Heavily influenced by Charles Fort's work and ideas, the authors' primary aim was to arouse the curiosity of their readership, stating "Let us repeat that there will be a lot of silliness in our book, but this matters little if the book stirs up a few vocations and, to a certain degree, prepares broader tracks for research". In a 2004 article for Skeptic, Jason Colavito wrote that the book's tales of ancient astronauts predated Erich von Däniken's works on the topic, and that the ideas are so close to the fictional works of H. P. Lovecraft such as "The Call of Cthulhu" or At the Mountains of Madness (published in 1928 and 1931, respectively) that, according to Colavito, it is probable that Lovecraft's fiction directly inspired the book. The book is the origin of the conspiracy theory that the Vril Society and the Thule Society were the philosophical precursors to the Nazi Party. The book is the origin of the claims of a fictional Maria Orsic, a Vienna-born Croatian woman who was supposedly involved with the Vril Society (Vril Gesellschaft) and vanished in 1945, going to "Aldebaran". The mythology of Maria Orsic has spread in the internet age, particularly among those inclined to Esoteric Nazism. The fifth track on The Flaming Lips album Yoshimi Battles the Pink Robots is called "In the Morning of the Magicians", referencing the novel. ^ Adams, Deborah (2009). "Review of "The Morning of the Magicians"". Curled Up With A Good Book. Retrieved 9 April 2010. ^ Lachman, Gary (2003). Turn Off Your Mind: The Mystic Sixties and the Dark Side of the Age of Aquarius. The Disinformation Company. ISBN 0-9713942-3-7. Retrieved 12 May 2010. ^ « Il y aura sans doute beaucoup de bêtises dans notre livre, répétons-le, mais il importe assez peu, si ce livre suscite quelques vocations et, dans une certaine mesure, prépare des voies plus larges à la recherche » p. 199. ^ Jason Colavito (2004). "Charioteer of the Gods: An investigation into H.P. Lovecraft and the invention of ancient astronauts". Skeptic (10.4).